Visual art can be one of the more solitary art forms. It seems conducive to the singular voice and an individual’s intuitive process. There are exceptions of course, where work is produced by multiple people and more than one voice is reflected in the outcome. However, I think it’s safe to say that most visual artists today spend the bulk of their time alone in a studio crafting work, sharpening ideas and searching for what truly wants to be expressed, then putting the work out to be quietly viewed. But in this relative quiet, the artist is also humming along in a vibrant human conversation. Visual artists carry the torch of our history as form-builders and mark-makers. The petroglyphs, monoliths, vessels, body embellishments, texts, objects, architecture, painted scenes and abstractions, the printing press, photography and into the digital realm–these are voices of a seeing, feeling, growing species. The artist’s ultimate task is to continue retelling and reframing this story of our shared human identity. So, are we alone, or are we together? One does not always have a clear sense. We are both alone and together. Innate fear of isolation keeps us reaching across chasms to build connection, while the comfort of communion gives us courage to go alone hunting for new territory. Collaboration gives the artist a chance to step out of what can be a consuming singular focus and dance the edges between ourselves and others. 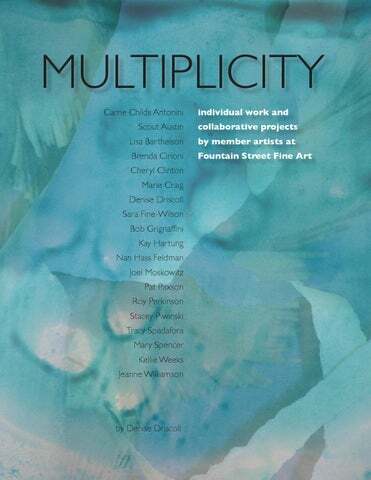 MULTIPLICITY is an exhibition in which 19 artists explore the nuances of individualism and connectedness by sharing solo work along with team-built work. Through cumulative painting, group drawing and sculpture, selfdocumentation with cell-phone photography, and with snapshot prompts sent to each other via satellite, our goal has been to playfully access more of ourselves, while revitalizing our connection to the larger conversation. Artists pass twenty-five 8 x 8 inch panels back and forth between themselves, altering and adding along the way. One artist receives a cell phone photo via messaging and sends a responsive photo along to the next person on the list. The last sender loops back to the first and the conversation continues. Each artist sees only the photo they receive and one they send along. With a background in architecture and dance as well as visual art, Carrie considers any medium she is working in to be a space where an active visual-spatial event takes place. In painting her gestures appear flat in acknowledgment of the surface, and remain inside the edgesâ&#x20AC;&#x201C; not anchored to the object of the frame, but floating and transitory like forms on stage. In her sculptural installations objects are minimal so as to pronounce the space that objects and viewer are occupying together. For Carrie, the platform for expression has as much curiosity and importance as what can be said within it. In her work Carrie plays with systems of order, making either few or many repeated marks, with the intent to show ordering as a human animal behavior. Her paintings and installations are about lingering in a space where cerebral diversions play with the wonders of sight and sense of place. 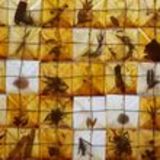 Carrie Childs Antonini has an MFA from Claremont Graduate University in Claremont, CA, and a BA from Hampshire College in Amherst, MA. Her work is included in the corporate collection of Bank of America and in private collections. Above Green Bodies Blue Cloud gouache on panel, 8 x 8 in. Yellow Marks watercolor on paper, 5.5 x 8.5 in. Right Blue Stripes oil on canvas, 66 x 48 in. Left View From Within encaustic with collage, 12 x 12 in. Above The Garden: Honeybee Retablo 1 encaustic with collage, 12 x 24 in. Prayer for the Bees: Honeybee Retablo 2 encaustic with collage, 12 x 24 in. Left messy house nest, family debris series 6 x 12.5 in. spend & save, family debris series twenty five 6 x 6 in. panels: 36 x 36 in. installed as group Above take over â&#x20AC;&#x201C; over take, family debris series 36 x 36 x 19 in. Left Barn Series: Spring Thaw mixed media painting, 12 x 12 in. Barn Series: Yellow Edge mixed media painting, 20 x 20 in. Above Barn Series: Chill mixed media painting, 40 x 30 in. Mystery Light 1 acrylic on panel, 24 x 15.75 in. Woodland Water Reflections 6 acrylic on Panel, 24 x 14 in. Woodland Water Flood II acrylic on canvas, 48 x 30 in. Left Reflection (Medfield State Hospital) archival photograph on aluminum, 24 x 16 in Remembrance (Beijing) archival photograph on aluminum, 16 x 24 in. Above Remainder (New South Wales) archival photograph on aluminum, 24 x 24 in. Left Exchanging Densities and Destinies mixed media on panel, 8 x 8 in. Dizzy with Insomnia mixed media on panel, 8 x 8 in. Above Quarks, Charms and Scents mixed media on panel, 8 x 8 in. Left Dream Studio by the Sea II oil on panel, 18 x 24 in. View Through Window in San Miguel II oil on panel, 8 x 8 in. Above Stone Urns by the Lily Pond oil on panel, 20 x 16 in. Left Coming Up For Air plaster, clay, glass, metal, plastic and silicone 12 x 12 x 6 in. Forward Fold clay, 14 x 12 x 8 in. Above Stack clay, 14 x14 x 8 in. I approach paintings with three desires. These desires are respected simultaneously. First, is to enjoy creating, to have fun throughout the struggles and challenges of communicating my ideas. Second, is to use the image I wish to paint as an excuse to celebrate the form and color that I see in the images, almost forgetting my recognition of what the subject is. Third, putting my attention back to the subject I wish to portray, I share how the image rests in memory. As I alter, distort and edit the image through my filter, I arrive at how I believe the image is remembered deep in my soul. Everybody takes a different story from a person or place. However, I can only honestly share my experience. What inspires me to share this experience is that it provides the opportunity to be honest. When someone is honest in whatever he or she is doing, it is beautiful. Art presents the task of creating one’s own language. I hope the paintings read as if my brush was clenched in my fist with ideas coming faster than my command of my language will allow me to communicate. Though a struggle may occur, I want the paintings to express that they were fun to create. Bob Grignaffini, an oil painter, also runs a successful landscape design business in his hometown of Wellesley. He has shown his work throughout the Boston area, most recently at Amazing Things in Framingham and the Frame Shop and Gallery in Natick, and Fountain Street Fine Art. He has recently relocated his home to Shelburne Falls, MA, where he also maintains a studio. Left The Local Commotions oil, 36 x 48 in. Old Woods of Nova Scotia oil, 20 x 30 in. Above Dance of the Three Sisters oil, 48 x 48 in. Left Cellular Connections 2 encaustic and mixed media, 20 x 20 in. Cells Surfacing 10 encaustic and mixed media, 8 x 8 in. Above Cellular Connections 1 encaustic & mixed media, 20 x 20 in. Left Aleph / Alif acrylic on paper, 29 x 23 in. Dalet / Daal acrylic and collage on paper, 29 x 23 in. Above Zayin / Zaay acrylic on paper, 29 x 23 in. Left Dreamscape 1 acrylic on canvas, 24 x 18 in. Dreamscape 2 acrylic on canvas, 18 x 24 in. Above Broken Connections â&#x20AC;&#x201C; Girl with Bonnet acrylic on canvas, 24 x 30 in. Left Midday Sun, South Shore of Island oil on canvas, 20 x 20 in. Tidal Flats at Sunset pastel on panel, 12 x 24 in. Above Rock Face, Lake Powell watercolor, 18 x 24 in. Above Billâ&#x20AC;&#x2122;s Daughter handwoven t-shirts and yarn, 10 x 10 in. Billâ&#x20AC;&#x2122;s Son handwoven t-shirts and yarn, 10 x 10 in. Right Bill 28 handwoven t-shirts and yarn, 78 x 45 in. Left Collection (Part 1) encaustic and mixed media on 30 wooden discs, each disc 3 in. in diameter, entire piece approx. 21 x 18 in. Evolve (Part 1) encaustic on gessoed wood panels, each panel 6 x 6 in., grouped together approx. 22 x 22 in. Above Vestige (Part 5) mixed media on wood boxes 15 x 24 x 3 in. Left Math of a Real World charcoal on rag paper, 23 x 17.5 in. Jay Showing His Ink charcoal on rag paper, 30 x 22 in. Above Seth with Honey Bees charcoal on rag paper, 30 x 22 in. Left Toppling encaustic, 24 x 24 in. Afterwards encaustic, 24 x 24 in. Above Suspended Belief encaustic, 30 x 30 in. Left 12 x 12 x 12 February 2014 mixed media on board, 12 x 12 in. Above Snow on Snow Fences #1 mixed media on board, 10 x 22 in. Snow on Snow Fences #3 mixed media on board, 10 x 22 in.